You may have already experienced the enticing aroma of Bergamot Essential Oil for years without knowing it! Bergamot has been the heady fragrance in "Earl Grey" tea, providing the spicy rich citrus overtones and scents that tingle your senses and excite tastebuds. The bergamot tree looks like so many other citrus trees, such as lemon, lime, orange, and grapefruit, but the fruit most closely resembles an orange or tangelo. The fruit is pear shaped, and the oil is pressed when the fruit is green. 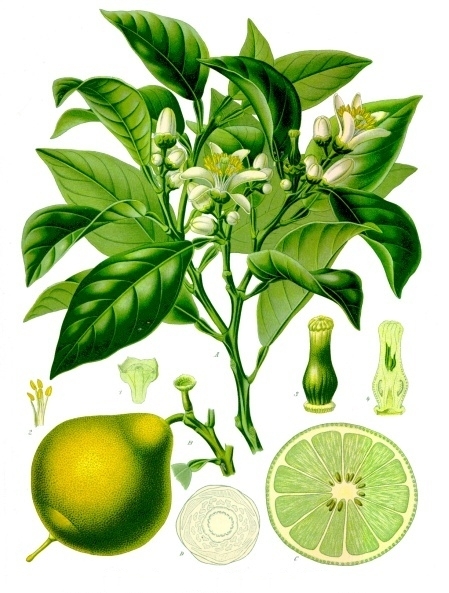 Bergamot is said to have made its way to Spain from the Canary Islands to Spain by the hand of Christopher Columbus. No other place in the world grows or produces the high quality oils that the trees grown in the province of Calabria, Italy can provide. The quality derives from a mixture of nearly perfect climate and soil conditions. Just as with fine grapes grown in regions of France and California have an impact on the fragrance and bouquet of wines, so it is believed that the influences of climate and region impact the quality of the bergamot. In Calabria, alluvial deposits of argillite and limestone create a nutrient and mineral rich soil unrivaled for developing the essences you have come to love and recognize as Bergamot. How is Bergamot Oil Distilled? Bergamot essential oil is obtained by distillation or pressure from the rind of the fragrant citron. Fortunately the fragrance of Bergamot blends well with other oils to provide a multitude of sensations in colognes and perfumes. By some estimates (according to Wikipedia), about a third of all mens colognes and perhaps half of all womens perfumes contain at least a small amount of Bergamot essential oil. You can purchase this incredible oil and add it to your favorite soaps and lotions to create your own aromatherapy products or add it to a diffuser to invigorate and energize your day. There is some evidence to suggest that it may cause phototoxicity in some folks, so be careful to avoid using products containing bergamot if you plan to be exposed to the sun for any length of time within 24 hours of its use. in it he says of Bergamot... "—This most useful perfume is procured from the Citrus Bergamia, by expression from the peel of the fruit. It has a soft sweet odor, too well known to need description here. When new and good it has a greenish-yellow tint, but loses its greenness by age, especially if kept in imperfectly corked bottles. It then becomes cloudy from the deposit of resinous matter, produced by the contact of the air, and acquires a turpentine smell. It is best preserved in well-stoppered bottles, kept in a cool cellar, and in the dark; light, especially the direct sunshine, quickly deteriorates its odor. This observation may be applied, indeed, to all perfumes, except rose, which is not so spoiled. When bergamot is mixed with other essential oils it greatly adds to their richness, and gives a sweetness to spice oils attainable by no other means, and such compounds are much used in the most highly scented soaps. Mixed with rectified spirit in the proportions of about four ounces of bergamot to a gallon, it forms what is called "extract of bergamot," and in this state is used for the handkerchief. Though well covered with extract of orris and other matters, it is the leading ingredient in Bayley and Blew's Ess. Bouquet (see Bouquets)." In aromatherapy, bergamot is considered useful for depression and mental alertness, it offers balancing, cooling, refreshing, stimulating and uplifting properties that are welcome in any stress-filled life. The scent is fruity, sweet, and rich. Imported from Italy, it comes from the variety, Citrus bergamia "Risso et Poteau"
It's easy to see why Bergamot Essential Oil is so popular....In fact, as I write this my wife is brewing herself a cup of Earl Grey tea now.